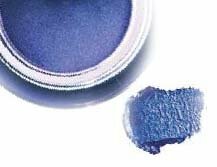 Intense and lustrous, this dewy cream eye shadow transforms into powder that creates a glaze of brilliant shimmery color. Crease-resistant. Long-wearing. Color looks brilliant alone or in combination.